Happy Friday! Yes, I’m still carrying on about that more than fabulous day. I really just want to savor it, ya know. These are the beautiful flowers my sweet Honey brought me last week. It’s been a full week and they look even better than when he first gave them to me, that’s one of the great things about carnations. He cracks me up. He always is sure to get long stems, baby’s breath, and what he calls the “green filler”. He wants me to enjoy a proper bouquet of course. Wink. They ended up in a straw tote hanging on the door to our guest room — aka our game room. It’s down the hall from our bedroom and the first thing I see coming and going up and down the stairs, so I get to enjoy them a lot. Does anyone else seem to be constantly running up and down the stairs with a puppy in one hand and a basket of laundry balancing on their head (not hardly)? 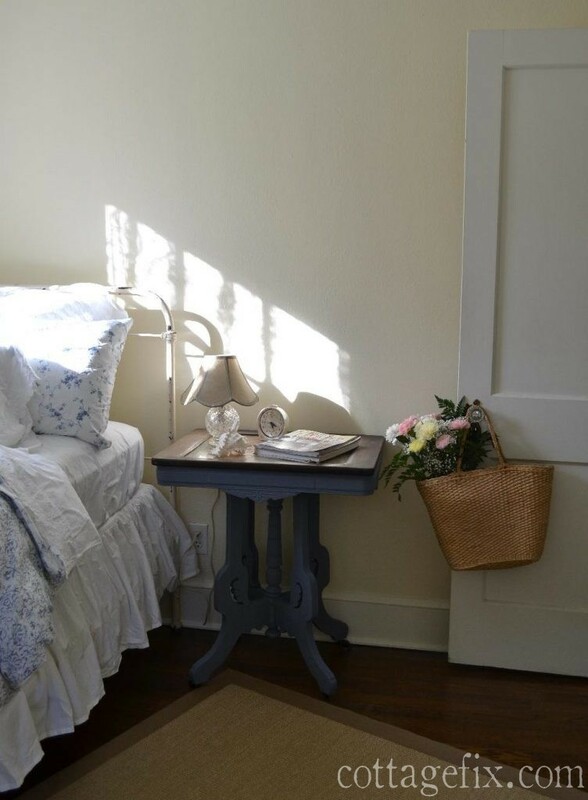 I love how the pale bouquet looks in here with the pale yellow walls, that’s why I chose the guest room. 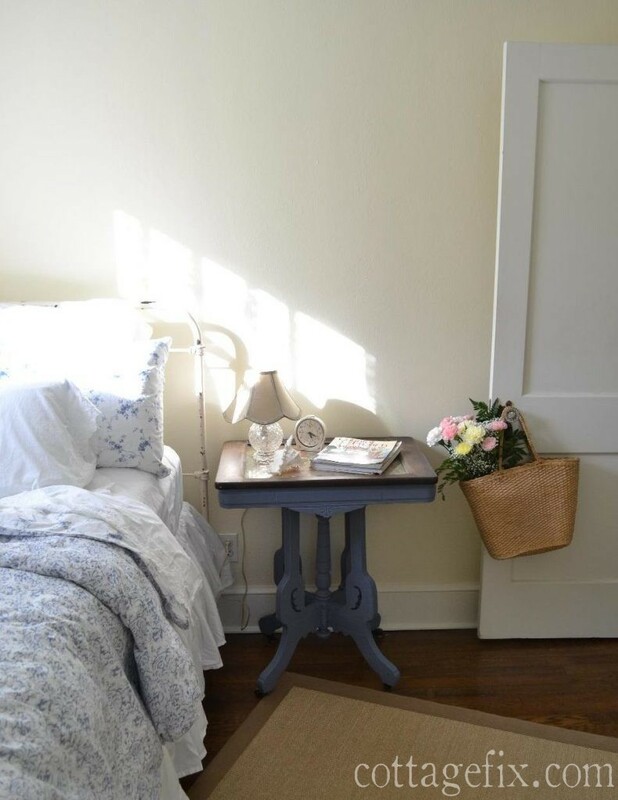 I love this room so much I thought about painting our bedroom pale yellow too. But somehow I just don’t think it would be the same, and there’s also the gray carpeting that I would need to contend with. No, I think I’ll just enjoy the happy yellow when I’m in the guest room here. 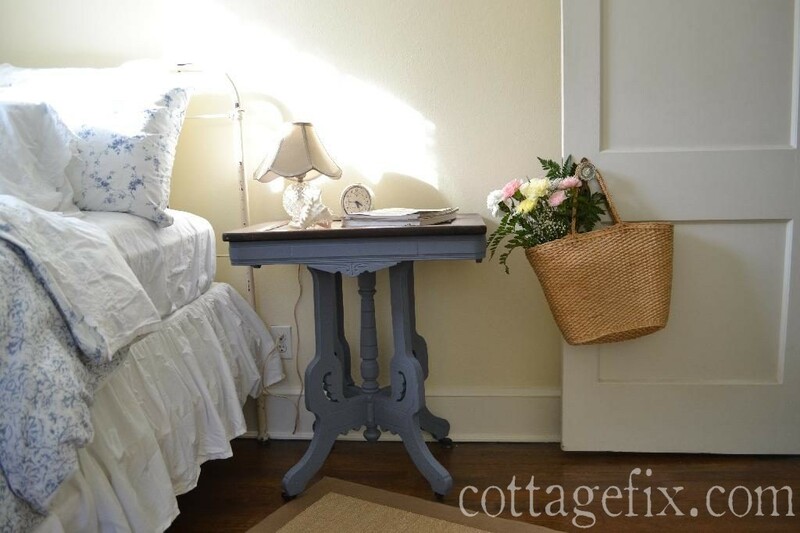 This entry was posted in Friday flowers and tagged accessories, cottage, decorating, flowers, shabby chic on April 22, 2016 by sally. So pretty as always, Sally. 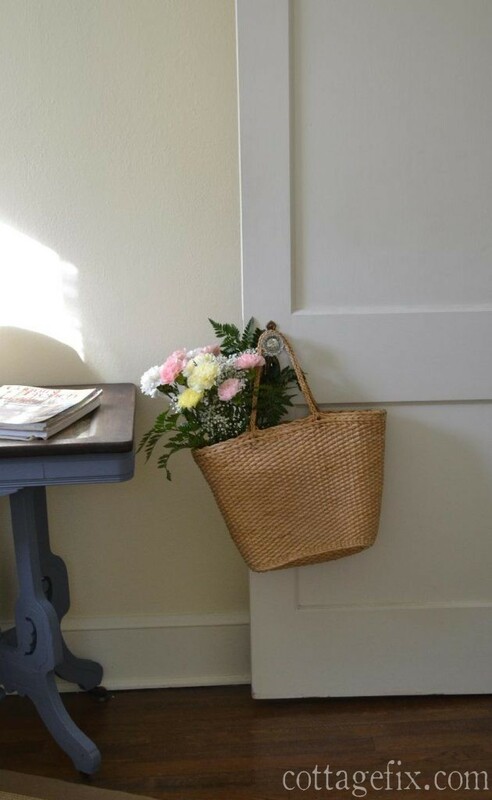 Love the flowers held in the basket and hanging on the door. 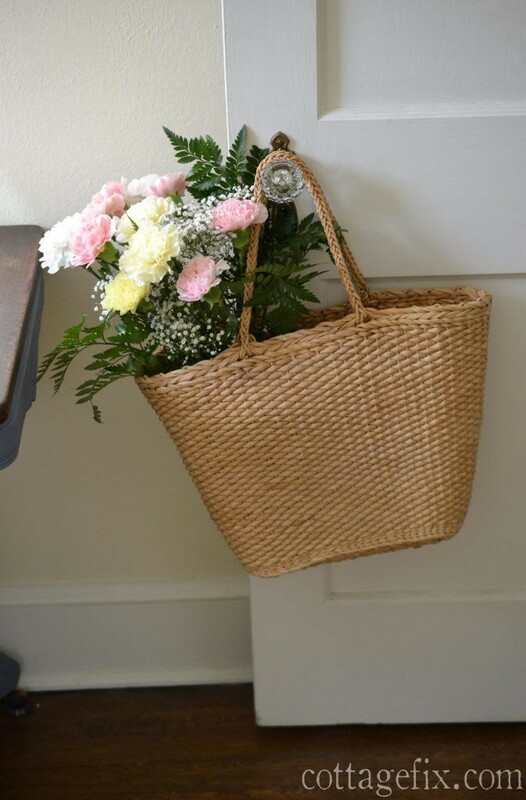 Your flowers look so beautiful in your straw bag! Your hubby did good!!! 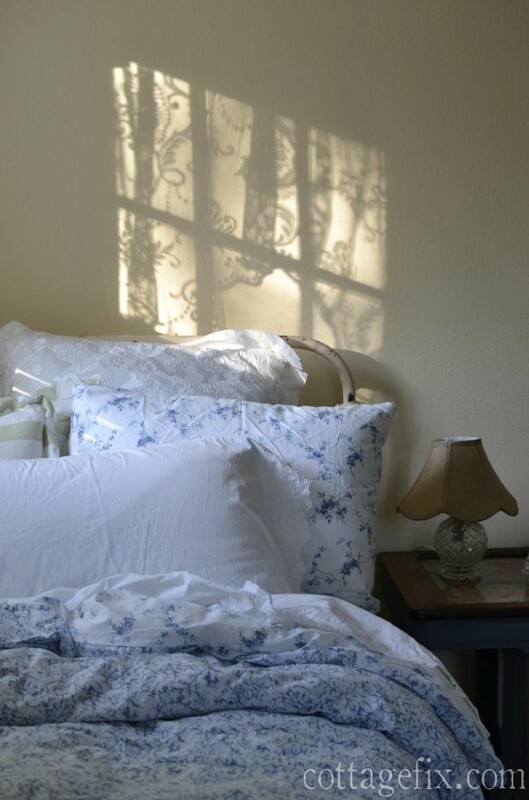 I love the pattern the lace curtain puts on your wall, so pretty:) I love pale yellow and it’s a color I plan on using after we’re in a place of our own (which is hopefully before the end of the year, fingers crossed!). Enjoy the yard sales tomorrow, I hope you find some good treasures!!! Your husband is so sweet to bring you flowers! They are so pretty. I love the “filler” that he included. Ha! I can see why you really like that guest room. It is so inviting and serene. Your guests will not want to leave!